I don’t even know how or where to begin to describe my life-long obsession with granola. The endless combinations of oats, nuts, dried fruits, and different spices are nothing short of exhilarating). I also love granola because it can be enjoyed dry, with milk, or with any kind of yogurt (which is also nothing short of exhilarating). My favorite thing about granola, however, is the crunch. Clusters of crunch is what leads me steadfastly affirm that this granola is the best in the universe. Not just a little bit of crunch, but a-whole-lotta crunch–medium-sized nuggets of crunch, in fact. The clusters aren’t gooey, sticky, oily, or so hard that they break your teeth. The secret is a perfect combination of maple syrup and egg whites, of all things. The clusters are the absolute perfect texture. Sadly, I take absolutely no credit for the clusters of crunch; Deb Perelman of Smitten Kitchen is the one to be honored, better yet, revered for this granola. There is no doubt about the fact that the woman is a culinary genius. What I love most about her though, is that she makes gourmet recipes easy and accessible to us common folk. I am smitten with her kitchen. Make this granola now. It is quick and easy. It will change your granola life, I promise. any sort of topping you would like–fresh fruit, dried fruit, etc. Preheat your oven to 300 degrees. Line a baking sheet with parchment paper. 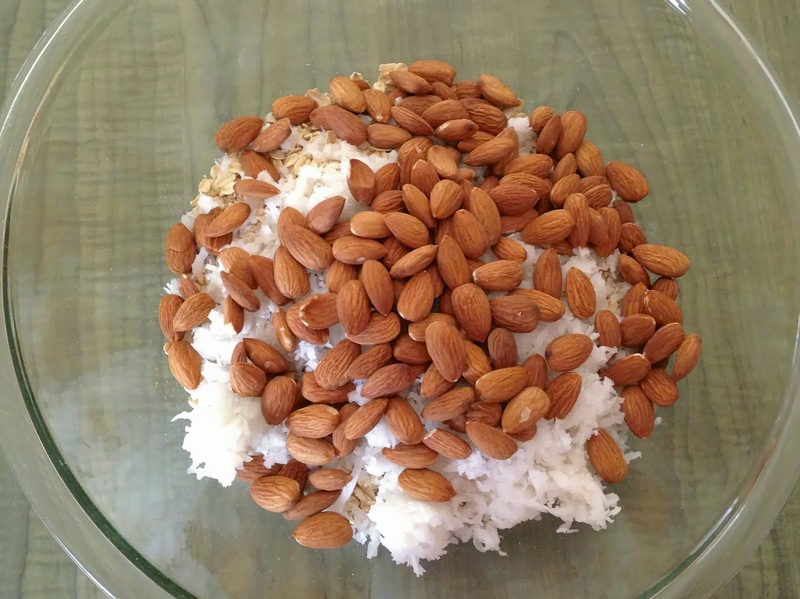 In a large bowl, combine all of the ingredients except for the egg white and whatever you picked as toppings. Toss evenly to coat. Whisk the egg white in a small bowl until frothy. 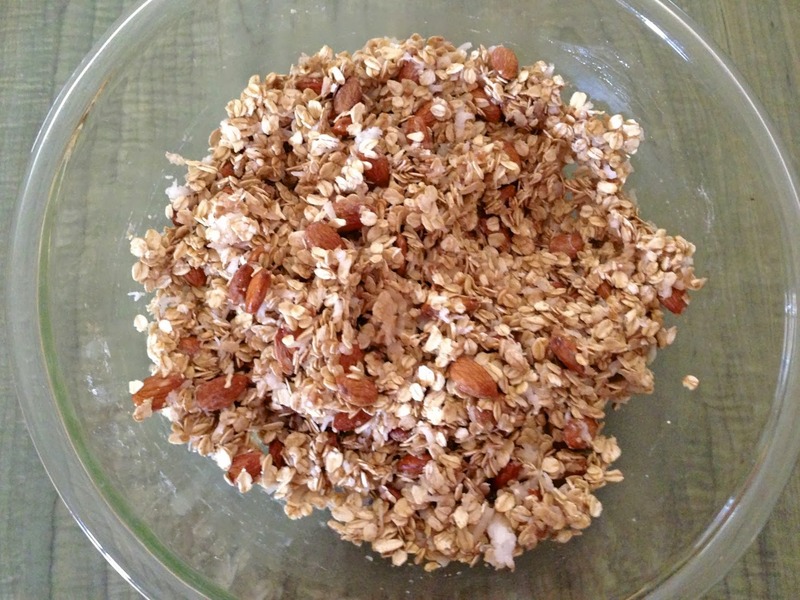 Stir into the granola mixture, distributing it throughout. 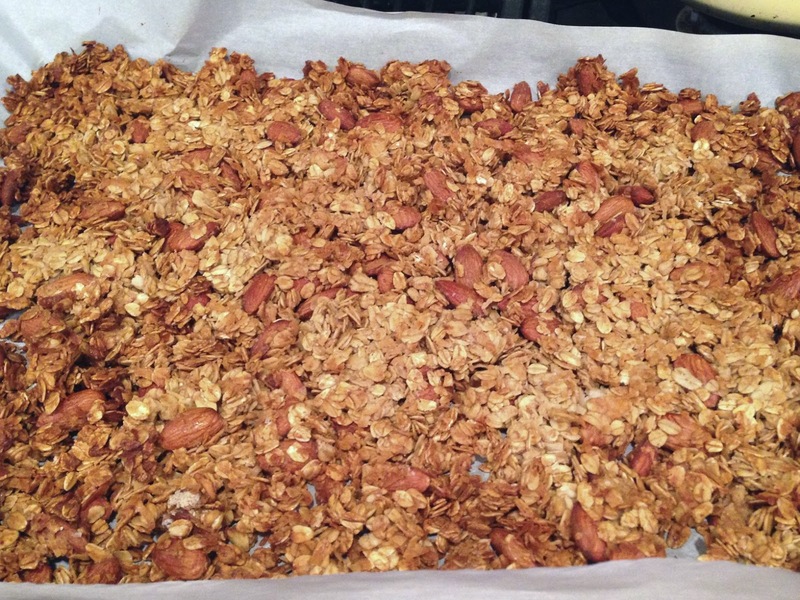 Spread the granola onto the prepared baking sheet. Pat down with a rubber spatula. Bake for 40 to 45 minutes. I found that if I use a dark pan, I have to cook closer to the 40 minute side of the range otherwise the edges almost burn. Watch closely. About halfway through the baking time, use a large spatula to turn over sections of the granola carefully, breaking them up as little as possible. I pretend that I am flipping granola pancakes in their little spaces. Rotate the pan and put back into the oven to finish baking. When the is evenly browned and feels dry to the touch, transfer the pan to a cooling rack. Once cool, break the granola into your desired size clusters. Top with whatever you want, if anything, and serve with milk, yogurt, or just plain.